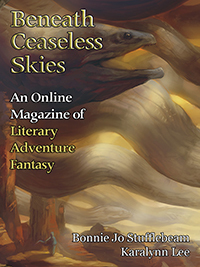 You can read the full story at Beneath Ceaseless Skies, the online managzine of literary adventure fantasy. From there you can also download PDF, MOBI PRC, and EPUB editions. When I come across you, there are forsythia blossoms scattered unnoticed in your hair, as though the shrub leaning above you wooed you in such secret that you remained unaware. You're unmindful too of how a daughter of a bloodline such as yours shouldn't be lying on the dirt on your stomach, staring at a spiderweb. It's so unthinkable that it has taken me a full hour to discover where you are; enough time for shadows to shift direction, or an assassin's blade to find you. Besides that, it's still early spring, and it is chilly outside. I chide you for being so careless, and you say indignantly, “But I was careful! I even drew the strokes in order—” and you show me your name as you have recently learned to write it, the characters spelled out perfectly within strands of spider-silk. Trembling along the last line, still spinning thread, is a spider. I have guarded you ever since your hundredth day, when you were dressed in colorful formal robes that you would never wear again because children grow so fast at that age. String and silver and calligraphy brush arranged before you, to see what sort of life might lie ahead: longevity or wealth or wisdom. No one knows which you might have picked, for a messenger rushed into the room to tell your mother of her mother's death. Those were his last words; he slumped across the table with a knife in his back, and you reached out and touched your fingers to his life-blood. An ill omen, especially for a girl who had just become the heir to the kingdom. Because I have guarded you since you were a hundred days old, the spiderweb doesn't surprise me. But it will not do to be so obvious with your gift. I coax you into releasing the spider. The great art of the court is subtlety, I tell you as I pick the flowers from your hair. Do nobles not hire assassins rather than killing each other themselves? Don.t turn a creature so blatantly against its nature. They say even children can speak with wisdom. Instead of answering, I brush away the web and tell you not to do this where others can see. Read the full story for free at Beneath Ceaseless Skies.